Preserving Your Wedding Dress for a Lifetime of Memories! On your wedding day, your bridal gown will be the most precious garment you have ever worn. You put a lot of time and thought into shopping for that ‘perfect’ gown. Once the wedding is over, it is highly recommended to have your gown cleaned as soon as possible. La Donna Weddings offers the services of a BridalKare Gown Preservation, a gown cleaning and preservation family-owned and operated cleaners that have been in business since 1890. Don’t hang your wedding gown. Over a prolonged period of time it may begin to stretch and sag. Don’t seal your gown in a plastic bag. Plastic attracts moisture which promotes mildew and fabric rot. Don’t expose your gown to strong light, open air, dirt or sunlight. Don’t keep your gown in the attic or basement where there are extreme changes in temperature and/or humidity. Repaired, if necessary, with minor repairs done free! Sealed in an air tight, acid-free environment to prevent mildew and insects from getting in and nesting. I would like to get my wedding gown cleaned and preserved. What do I do first? 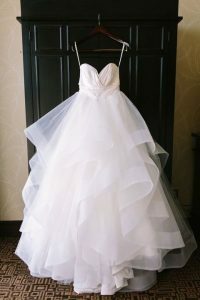 Complete related sections of our inquiry form or call us at 586-469-9100 to set up an appointment to bring in your gown. It is as easy as that. No, as the cleaning of your gown to ensure proper preservation is included. There are several different processes that are used for cleaning. Each gown is evaluated upon its arrival and the best cleaning process for that particular gown is used. All of the processes are safe, gentle and environmentally safe. Your gown is then fitted on an acid-free bust form and packed in an acid-neutral preservation chest. Please note shoulder pads and bust pads must be removed as they could cause damage to the gown over time. They will be wrapped in tissue paper and packed underneath your gown. Approximately 95% of all stains are removable, including tar, blood, perspiration, grass, mud, grease, and food, being the most common, as well as any sugar stains from cake icing, wine and other beverages. You will be able to view your the bodice of the gown and veil. Any other items will be positioned at the bottom of the window, where possible, or packed underneath the gown. You may also send items such as your veil, headpiece, gloves, garter, moneybag, handkerchief, slip, etc. Additional fees may apply. A highly trained staff is available, if repairs are requested. Minor repairs are done free of charge. A nominal fee may apply to more extensive repairs. If you would like a call with a repair quote, just let us know when you bring in your gown. Please allow 4-8 weeks (depending upon the season) to receive your gown back to be assured that your gown receives the individual attention it deserves. The cost of additional shipping insurance coverage over the first $500 is $2.00 per $100 of additional declared value. In considering the value of your gown, remember you are sending a used gown, not a new one. Your gown will arrive triple-boxed; outside shipping box, middle storage box and window display box. You may store your gown using all three boxes or omit the outside shipping box. Place box in a horizontal position, NEVER on an end or side, to avoid gravity pulling your gown downward. NEVER store your gown in an attic or basement. YES! A lifetime warranty is possible because of the exclusive 11-point cleaning and preservation process which includes sealing your gown in a beautiful windowed display box. A lifetime warranty against damage from mildew, bacterial mold, light, moth larva and other insect infestation is provided, as long as the seal is not broken. Warranty also covers any fabric discoloration, yellowing, and caramelized sugar stains from appearing. If at any time your gown is found to have yellowed or has caramelized stains the gown will be reprocessed at no additional cost. If reprocessing is found to be unsuccessful, you will be refunded the preservation cost. Beads, sequins and glued on items are not covered under the warranty. Since the materials or the quality of the materials used by the manufacturers for beads, sequins or glue cannot be controlled, yellowing or aging of these items may occur over time, even when the gown has been properly preserved.